Hey look a new book on Irrlicht! Basic overview of the engine accompanied by some simple example code. I don’t think the longest code example is more than two pages. Ha, it mentions Ludumdare in passing, one of the examples require a sprite sheet image from “A Practical Survival Guide for Robots” and gives an LD url to get it. So there you have it, it does what it says on the tin: a no-nonsense, well illustrated, beginner’s guide. 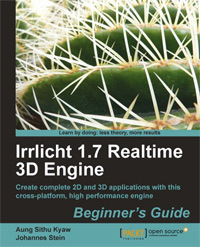 Only useful for those absolutely new to Irrlicht – very quickly you’d want to switch to the real tutorials to go deeper. Learn Novashell from a book! This entry was posted in Reviews on November 24, 2011 by Seth.